Does one ever need an excuse to make brownies? Nope. Hello, west coast brownies. I didn’t sift anything (per usual). I cut down on the salt because I used some salted butter. I cut each kind of sugar from 3/4 cup to 1/2 cup; jk, I used 1 cup white sugar and a nice pour of molasses, since there wasn’t any brown sugar in the cupboard (almost used some brown rice; that would have made things crunchy). No unsweetened chocolate, so Trader Joes’ Pound Plus dark chocolate it was. It’s k, the extra sugar in the chocolate must have evened out somewhat with the decrease in added sugar. I did a couple teaspoons of ground French Roast coffee instead of espresso powder, though I probably should have done more. I wasn’t paying attention to the ingredients and used a smaller amount of a less strong product. Oh, well. I used toasted walnuts in the batter (PSA: TOAST YOUR NUTS. THAT IS ALL). The batter turned out very whippy, a shade of pale brown and not dark brown; there wasn’t that much cocoa or melted chocolate homogenous inside the batter, so that makes sense. It had a good coffee flavor at this stage, though I knew some of it would bake off. I used a jelly roll pan (maybe the size of a half sheet pan? Not sure); this was too big. I didn’t spread the batter all the way to the edge because it would have made for a too thin brownie, and some spots were already worrisome. I baked it for 15 minutes, which was way less than the suggested time, which solidifies even more the fact that the pan was too big. I think a 9×13, or even an 8×8 pan, would be fine, especially if you like thick brownies like I do. Just increase the baking time to compensate for the extra thickness. These west coast brownies are soft and cakey. Do not come here if you want something fudgy. If you like fluffier brownies, or are okay with imagining that this is a piece of sheet cake, go for it. It’s not very dark, which may make you think that it’s not going to be chocolatey enough. Minus 100 points for Gryffindor, because the chocolate chips kind of melt into the brownie and add chocolatey-ness within the brownie flesh that goes beyond the pockets of chocolate (apologies if this makes no sense whatsoever). They were super buttery (which is good- you don’t put that much butter in hoping it disappears like it kind of does with scones), and a touch boozy. At least, I thought they were a bit heavy on the Kahlua, even though there wasn’t that much and it should have cooked off in the oven and no one else tasted the alcohol. Maybe you’re not into Kahlua or alcohol at all; then up the amounts of vanilla and coffee you use. 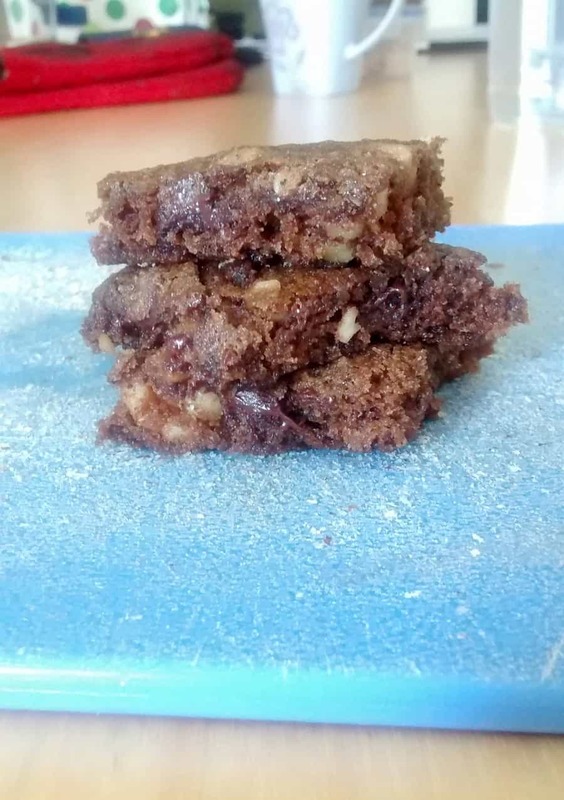 If I had a surrogate baking grandma, it’d be Maida Heatter because these brownies are fab, not to mention these chewy almond meal-based cookies that she has you roll in pignolis, even though I pat on sliced almonds instead because they’re cheaper and the rolling is impossible with such a wet dough. Make those after you devour these. Butter a jelly-roll pan. Line with parchment paper. Then butter the paper. Cream the butter. Add sugars and beat well. Add the eggs, Kahlua, vanilla and espresso. Add the melted chocolate and beat until blended. Mix in the dry ingredients. Stir in the chocolate chips and nuts. Turn into the pan and smooth the top. Bake at 375F for 25 minutes until a toothpick comes out clean and dry. The cake will feel very soft. Cool in the pan before cutting squares. I feel like cakey brownies don’t get enough love- it’s always about fudgy brownies, but both are so good! Thanks (: Taste is always more important to me than appearance, despite what social media focuses on!